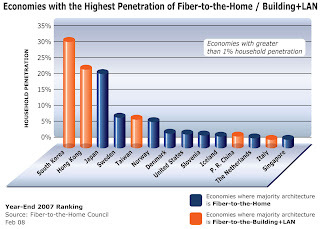 Last week, the FTTH Council North America, Europe and Asia-Pacific released a world rankings document titled Fiber to the Home Deployment Spreads Globally As More Economies Show Market Growth. The global ranking follows the unified definition of FTTH terms announced by the three councils last year, and which has formed the basis for recent market research by each council. For completeness and accuracy the ranking includes both FTTH and FTTB (fiber-to-the-building) figures, while copper-based broadband access technologies (DSL, FTT-Curb, FTT-Node) are not included. "It is no accident that Asia-Pac continues to be the fastest growing region for FTTH in the world, with more subscribers connected on fiber than all other regions combined. The rollout of FTTH has been encouraged by forward-looking governments and regulators in the Asia-Pac region for several years now. They understand that FTTH is a key strategic national infrastructure."